Experience a dream-like combination of sport and vacation at IRONMAN Cozumel! Welcome to paradise! There are probably very few races worlwide that are as worthwile as IRONMAN Cozumel. Here you can combine the race with a Caribbean vacation that has no equal. Let Cozumel enchant you! 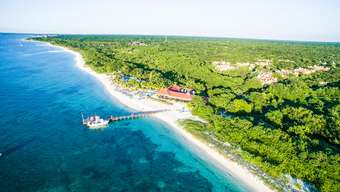 The luxurious, spacious and bright All Inclusive resort Occidental Grand Cozumel is set amongst tropical gardens and a long white sand beach. You can get to the Palancar Reef in only 15 minutes by boat. It is about 20 km to the island capital San Miguel and 9 km to the IRONMAN start line. The perfect start point to an amazing race and holiday! We are not only a sports specialist but also a tour operator who can organise an after-race round trip through Mexico or the United States. We will gladly give you an overview on the possibilities. Cozumel is an island of 65.000 inhabitants in the Caribbean Sea off the Eastern coast of Mexico's Yucatán Peninsula and belongs to the Mexican state Quintana Roo. The underwater filmmaker Jacques Cousteau established the worldwide fame of the small island (45 km long and 15 km wide) as a diver's paradise. Most tourists are attracted by the Palancar reef for snorkeling and diving, but the underwater caves off the Chankanaab Lagoon are also well-known for their tropical fauna and flora. Cruise ships dock regularly on Cozumel, a duty-free zone. 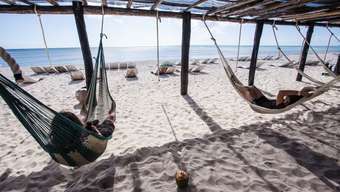 The connection to mainland is excellent, thank to two airlines and several ferries from Playa del Carmen. The transportation hub is the island's capital, San Miguel de Cozumel on the West coast. Air and water temperature are a pleasant 25°c approximately in November, the humidity ca. 70%.